Chocolate models were all the rage this past week on the catwalk at the Salon du Chocolate, an event held in Paris. Haute couture models donned coats, dresses and other items made entirely of chocolate. "Chocolate models" may also refer to models or molds to create shaped candies out of melted chocolate. You've probably never seen such odd creations as the gowns made from chocolate of all sorts for the annual chocolate show. Chocolate balls covered one woman's torso, resembling Milk Duds gone wild. Even singer Lara Fabian posed in a chocolate-encrusted gown accessorized with a long chocolate-ball and bead necklace. From Paris to New York, the Salon du Chocolat is a trade show for the chocolate world. The fashion show is the latest attempt to generate press for the show, and with good results - chocolate models fascinate the casual observer. What is it like to wear pounds of chocolate? Are the models ever tempted to nibble at their dresses? How do they keep the chocolate from melting from body heat and the hot spotlights of a fashion show? While no reports of models snacking on their dresses surfaced, many of the dresses use body suits with chocolate affixed to them, which probably keeps the confection from melting. If you'd like to catch the American celebration of chocolate, it comes to New York City just in time for that feast of all things candy, Halloween. Visit the website for all the sweet details. Chocolate models may also refer to models or molds to actually shape various types of chocolate. Like a gourmet truffle maker, chocolate models or molds are easy to use. Most modern chocolate molds for the amateur chocolatier are plastic sheets with cavities or depressions in which you pour the chocolate. Always wash new chocolate molds with water and dry thoroughly before using, and never heat them or use boiling hot mixes in them - they begin to melt around 160 degrees Fahrenheit. You'll need to hand wash them too, since dishwashers use very hot water. 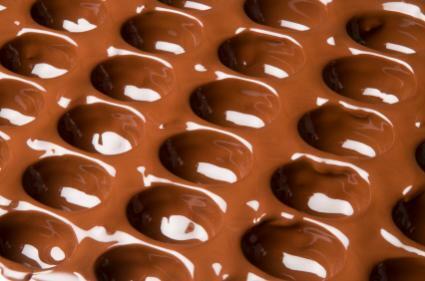 You can purchase chocolate molds with general, all purpose shapes to make candy bars, dots, round candies, or any shape. Flowers, fruit, animal shapes and holiday shapes are also popular. Some molds are used with lollipop sticks, available at craft stores, to create chocolate pops. To use a chocolate mold, it's important to purchase chocolate especially made for making candy. It melts easily and reforms into solid blocks. You can purchase it at craft or gourmet stores. Milk chocolate, dark chocolate and white chocolate are all available.Purchase the chocolate and melt in a double boiler. A double boiler is simply a pot of water, brought to a boil, with another pot inside the pot of boiling water. Chocolate is placed inside the dry pot and the hot water heats and melts it. Double boilers are used to melt chocolate because chocolate burns or scalds easily, and not only can you ruin your chocolate, but you can ruin your pots too. Another method is to place chocolate in a microwave safe bowl. Heat on high for one minute, stir, and repeat. Do not try to heat it for several minutes at a time. It can burn or scald. Instead, heat in thirty second or one minute intervals, stir, and repeat until the chocolate is melted. To pour chocolate into the molds, simply use a teaspoon or tablespoon and drop the chocolate off the spoon and into the mold. Don't worry if any excess drips onto the flat portion of the mold. It comes off easily. Be sure the mold is laying on a flat surface for steady, even chocolate. When the mold cavities are filled, place the mold into the freezer. When the plastic looks frosty or the chocolate is hard, remove from the freezer. Place the mold chocolate-size down and give it a gently tap. The candies should fall right out. If any chocolate clings to the edges, peel it off with your fingers. Wash the mold by hand with warm, soap water. Store chocolate candies in air tight containers or wrap up to give as gifts. It's likely that chocolate molds were used to make those fascinating creations that the chocolate models were wearing. Whether you want to see chocolate models or use a chocolate mold, it's an amazing world when something as delightfully sinful becomes…sinful haute couture.